If you are going to buy one of these, today is the day. This listing is the listing. This means the battery is fresh. We have the cars made to order. The manufacturer makes them after we order them. This is good news...this means the battery is not sitting on the shelf forever. Your order has a fresh new battery because we sell through fast and we continually rotate the order to provide fresh life batteries. When we say new in the box..we mean new in the box. Dual Battery System and Dual Motor System for a motor on each back wheel. WE SHIP TO THE CONTINENTAL US PHYSICAL ADDRESS ONLY. NOT AVAILABLE FOR HAWAII OR ALASKA. This is the coolest and most incredible ride on toy for kids Ever !!!! Crazy!!! I love this thing! Are you ready to ride? 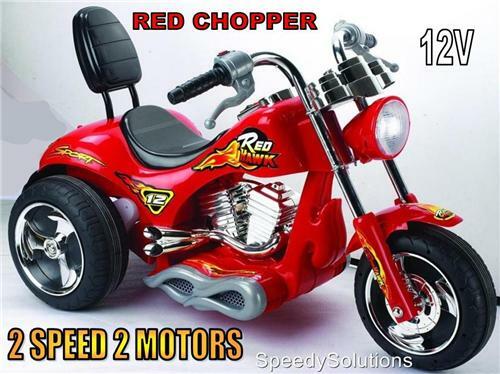 This is a real dual battery ride on toy. Put away the electric jeep and step into the racer of choice! These are really cool. This is one awesome motorcycle. Push the Thumb switch on the throttle and your off.......VAAARRROOOOM! Perfect for your kid if they are not affraid of speed. Made for kids about 4-7. See the specs below. IINCLUDES: Car assembly required but not too much on this one. Special note: Please use precaution with any ride on. Never leave your child unattended when opperating a scooter or electric ride on. Protective wear is always recommended. Please purchase this item only if you are commited to watching your child and protecting thier safety. SpeedySolutions and any individual affiliated with SpeedySolutions are not liable for any injury suffered while using or misusing this item. The buyer agrees that they will assume all responsibility for the health and safety of the child riding the bike and futher agrees by bidding that the seller will be held completely 100% harmless relating to injuries caused by using this item. Please understand that your bid on this is a legal and binding contract between you and the seller. If you don't agree with the terms relating to the safely policy above, the costs of the item, the item return and exchange policy or any other portion of the listing, please do not bid. Thank you. See Item Below. This is AWESOME!!!!!!!!!!! Exchange and refund policy: All items are sold new in the box. Although we don't ever anticipate any issue with the item, we do have a policy to cover the potential of issue with this item. Most often if there is an issue mechanically with this item, it is something that can be resolved quickly through a few trouble shooting efforts that can be coordinated via email or over the phone. Simple diagnosis of the issue will result in correcting it without much effort. If it is determined that parts are needed, we will ship the parts or reimburse you for the small parts purchased that will resolve the issue. This does require that the buyer will participate in the troubleshooting and small part replacements that are normally very easy. More complicated repairs can be done at our facility as a last resort if our trouble shooting efforts don't correct the problem on the buyer end. Buyer will then ship the item back to us and we will facilitate the correction and return the item to you. Normally buyers are responsible for all shipping so correcting it on the buyers end is the most preferred resolution. We will accept returns for refunds but please be aware that the buyer is responsible for the cost of returning the item to us and we will refund the cost of the item only and not original shipping costs since the cost of shipping is actually a third party charge. Please be aware that this policy is valid for 30 days after the purchase. Any issues must be reported prior to the 30th day after your completed purchase. Please inspect your item carefully upon arrival. As an extended service that is not offered by most of our competitors, after thirty days, we will still help troubleshoot and we will offer any needed parts that you can purchase at our cost which saves you money. Again, we never anticipate issues, but this is our policy for all ride on toys.